The Triassic-Jurassic mass extinction occurred roughly 200 million years ago, about 50 million years after the end-Permian crisis, and it may have shared similar causes. The Triassic-Jurassic is also associated with large-scale volcanism; in this case the Central Atlantic Magmatic Province that erupted as Pangaea was ripped apart. While it was the final end for some old lineages such as ceratitic ammonoids and conodonts, this was the first major mass extinction experienced by a largely “modern” marine fauna, with a highly mobile invertebrate community and reefs built by stony corals. In fact, the extinction may have helped kick off a period of intensified ecologic competition and innovation known as the Mesozoic Marine Revolution¹. 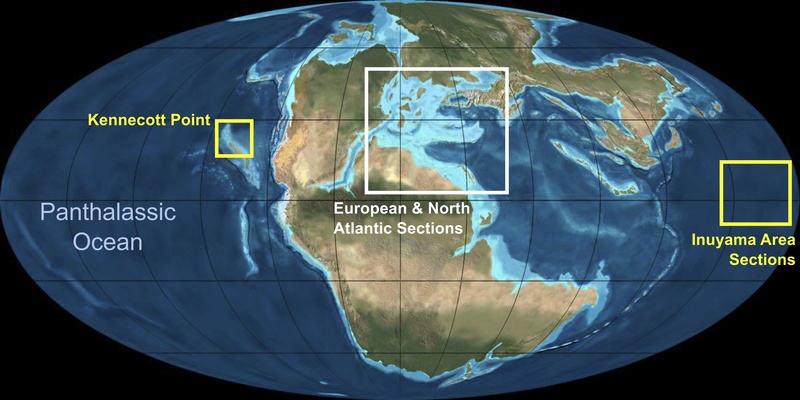 Unfortunately, the majority of our knowledge the Triassic-Jurassic boundary crisis comes from Europe and eastern North America, representing a limited area of the Late Triassic ocean. The Panthalassic Ocean, the predecessor to the modern Pacific and the world’s largest ocean at the time, is only beginning to be explored. Paleomap by Dr. Ron Blakey, ©Colorado Plateau Geosystems Inc. I am currently investigating marine sediments deposited across the Triassic-Jurassic boundary, from two widely separated localities that bracket the ancient Panthalassic ocean: Kennecott Point in British Columbia, and the Mino-Tamba sections located outside of Inuyama, Japan. Kennecott Point: Kennecott Point is a well-studied section on Graham Island, in the Haida Gwaii of British Columbia. Deposited in a slope environment on the flanks of the volcanic Wrangellia terrane, the section was likely located hundreds of kilometers offshore at the time of the Triassic-Jurassic boundary. I contributed nitrogen isotope measurements to a comprehensive organic geochemical study by Kasprak et al. (PDF), and recently published a study applying paleoproductivity tools to understand how the environment responded to changes in nutrient cycling (PDF). Inuyama: In 2013, I collected sample sets from the Kurusu and Katsuyama sections, located on the banks of the Kiso river outside of Inuyama, Japan. They are part of the Mino-Tamba terrane, a colorful succession of bedded radiolarian cherts deposited on the seafloor of the equatorial Panthalassic Ocean throughout the Permian and early Mesozoic. These sediments are probably our best window into the deep waters of the open ocean during the Triassic-Jurassic boundary crisis, and I plan to compare them with results from Kennecott Point to assemble a broader understanding of chemical and biological conditions in the Panthalassic basin. ¹Vermeij, 1995. Economics, volcanoes, and Phanerozoic revolutions.